Dr. Wily seeks once more to conquer the earth with his robotic creations and it's up to Megaman to stop him. This time, Megaman will face the likes of six different robot masters and the monsters within their levels. These bosses are Torch Man, Blade Man, Oil Man, Bit Man, Shark Man and Wave Man. Mega Man 3 is a side-scroller platform game. Megaman's main abilities are his ability to fire energy shots from his arm and his jumping ability. When Megaman confronts a boss, he must bring their energy meter down to zero at which point they are destroyed and Megaman can claim a special weapon unique to that boss. Megaman is also able to swim in this particular game. Instead of creating a faithful port, Hi-Tech reduced the excellent anime characters that NES fans have come to know and love to laughable animated blobs - with Mega Man himself looking like a broken-doll version of Commander Keen ... a cabbage patch doll gone awry, so to speak. 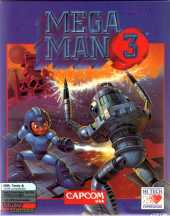 The graphics are dull, and even the innovative gameplay that lets Mega Man transform himself into different robot types can't save the game from mediocrity. Overall, a good example of how to botch a blockbuster console license.